What is the difference between a semi-custom and a custom illustration? Price? And time frame? A semi-custom girl can be customized to an extent. You may select hair/skin/eye/dress color and can add a specific crown/sash, but other than those selections it cannot be customized anymore. The hair length, face shape, features, and body size all remain the same. The outline will stay the same and only the coloring will change. Semi-custom is at a lower price range from $10-$35. You will receive a free digital edit with the purchase of any semi-custom products and do not need to purchase anything else before purchasing a "semi-custom" product. Semi-custom products can be completed in less than 14 days. 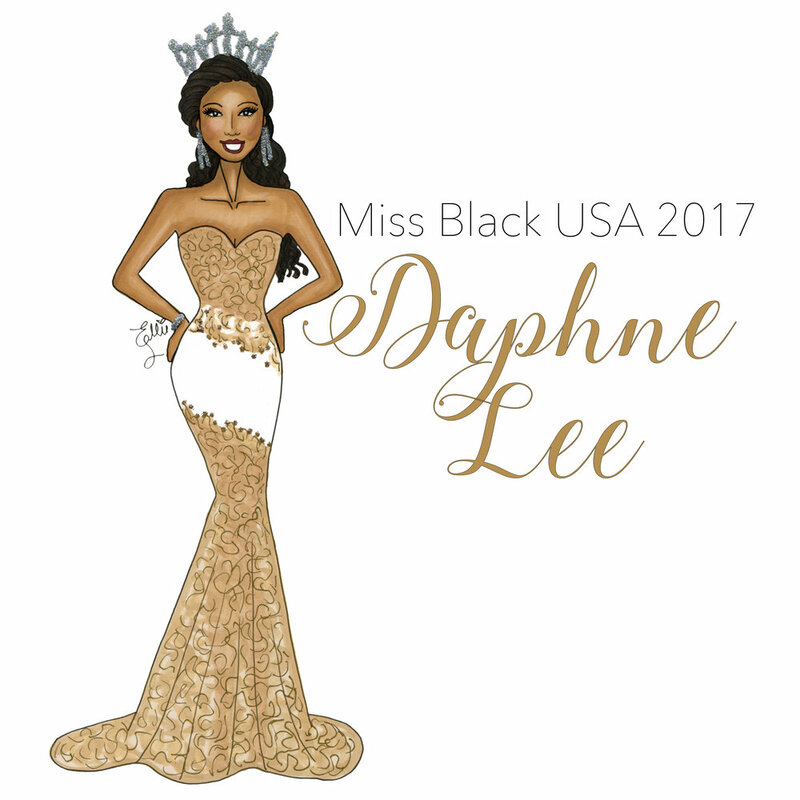 A custom illustration is a detailed re-creation of a specific pageant/prom/wedding gown and will resemble the appearance of the girl wearing the dress. Because it is completely customizable and one of a kind, the price point starts at $175. Custom illustrations can take anywhere from 2-7 weeks depending on my workload and the complexity of the dress. There is a rush option that guarantees your drawing within ten days for an additional $50. In order to purchase "Custom Illustration" products, you must first purchase a custom illustration. Once you place an order please email photos of the gown on and off stage and a headshot photo to ellielillustrations@gmail.com. The best photos are usually ones off stage, usually the ones you take at the stores or alterations place. Stage lights tend to make the color look different and hides the details of the dress. Unfortunately I do not have an upload photo option on my website just yet. What is a digital edit? A digital edit is an emailed jpeg image of an illustration. Photos below show the original illustration on paper and the electronic digital edit. On the illustration itself, the text is on the bottom. On a digital edit I place the text to the side. Every custom illustration comes with a digital edit. Unfortunately I cannot sponsor individuals. I do have business opportunities for state directors and pageant systems as a whole, but I wish you all the best in your upcoming pageant! Do you draw anything other than pageant/brides/cheer/dance? Yes! I have drawn a mixture of different activities and uniforms! However, custom orders start at $50 - $150. What sizes are the illustrations? Custom illustrations are drawn on 11"x14" paper. Cheer/dance, sorority, wardrobe, and dress illustrations are drawn on 8"x10" paper. Semi custom prints you can either select 11”x14” or 8”x10”. Do you do logo designs? Yes! I love to work with businesses to create logos for their brand. Logo designs start at $175. You will receive the image in different file formats to use at your discretion. Please email ellielillustrations@gmail.com to begin the logo design process. Can I order products of my illustration at a later time? Yes! I keep all images on file and you can purchase a digital edit or products at anytime. Can I order additional prints of my illustration? Yes! You can order different sized prints at anytime. Please email me at ellielillustrations@gmail.com. I messaged you, but I didn't get a response? Between Instagram and Facebook comments, direct messages, notifications and emails; messages sometimes get missed! The best way to get in touch with me is through email at ellielillustrations@gmail.com. I don't always check my social media accounts because of all the notifications. If you tried to get in touch and did not succeed, please email me again at ellielillustrations.com! Also, please note that there is an L in the middle of Ellie and Illustrations. Be sure to check the email was sent to ellieLillustrations@gmail.com. I have gone to part time work. I try to work all day at least once a week. Otherwise I try to find time between nap times. If you haven’t received a response from me, it’s most likely because I haven’t worked yet that week. For digital edits and semi custom work it can take anywhere from the day you placed the order to up to 2 weeks, depending on my work schedule. Custom work can take up to 8 weeks. Please email me if you need an item by a certain date. I ship United States Postal Service priority mail. It takes packages 2-4 days to arrive. My sales vary. Sometimes they are planned out and scheduled around holidays, other times they are impromptu. The discount varies with each sale. I do not let people know about the sale in advance. The best way to know about sales is to follow my Instagram and Facebook page regularly. Unfortunately I cannot honor a sale price after the sale deadline has passed.